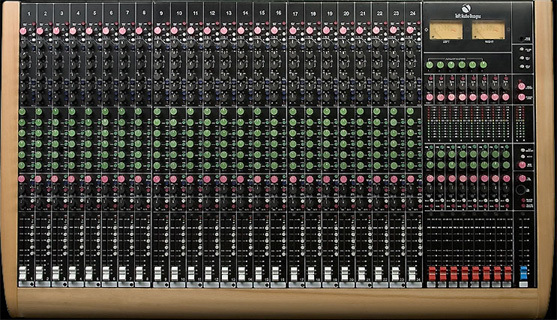 The Toft Audio Designs ATB-24 is a 24 channel analog console. It's basically a recreation of the classic Trident 80B console that is loved by so many. Malcolm Toft was the original designer of this console and started up Toft Audio sometime after. I don't know all of the technical characteristics, but it seems like it's pretty much the same console from what they say. Each channel has everything you'd expect from a console, with built in EQ, phantom power, auxiliary controls, faders - the whole nine years. I don't know what all of the connections are on this, but it's not rack mountable since it's a big console. You can find all of the specifics on the console right on their website or from any dealer. If you understand the basic make up of an analog console, you should be able to use the Toft Audio Designs ATB-24 with just a brief introduction as to where everything is. Even if you don't have experience with using a Trident 80B series console, this is fairly easy to understand as there isn't anything out of the ordinary that I picked up. Sure, the cue section will take a little bit of learning, but that's always going to be the case with a new console. The manual is a good thing to have around if you're looking to learn everything about it, but experienced analog console users should be able to learn the basics without one. The sound of the Toft Audio Designs ATB-24 is definitely true to the Trident 80B console. I've used both, but never side by side, but from memory they sound pretty freakin' close to me. The preamps are nice a pristine but still have a good amount of depth, while the EQ's are in depth and sound clean as well. I just started working at a new studio that has this console, and although we do use it for it's preamps, most of the time we're using it for monitoring. The Toft Audio Designs ATB-24 is an amazing way to get a classic Trident console for a small portion of the price. It's sleek and the design is great, not to mention it has a great sound and pretty much all of the features you'd want in a modern day analog console. Professional studios looking for a console to compliment their outboard preamps should definitely consider this as it's a legendary sound for a great price. 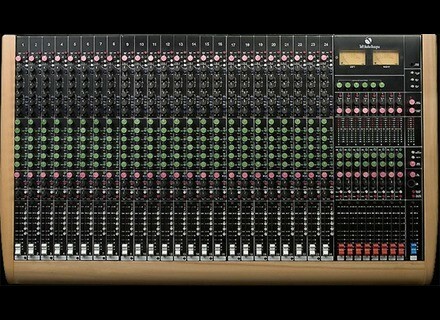 24-channel inline mixer with 6 aux, 8 groups, 8 FX returns, 3 stereo inputs, 2U rack PSU, blah blah blah!!!! Can be used for recording and mixing. Easy to use. It has talkback, switchable solo-in-place / PFL (24 holes at the bottom give you access to the Solo/PFL switches for each channel). Best of all is the EQ, I didn't expect such an incredible quality. Listen to the sound of the EQ between 4 kHz and 6.3 kHz where it normally sounds awful!!! The EQ sounds very smooth with a nice bottom end. even though the main output is via balanced phone jacks, which don't seem to be as reliable as a pair of XLR's! Very good manufacturing. The knobs have a very nice feel, much better than the faders. The EQ is fabulous. fpoitevin's review (This content has been automatically translated from French)" Success"
It is a version without a mechanical reinforcements, the LEDs "Solo" and some additional links in symmetrical (visit Toft). I bought it used it for over a year for a home studio application. I make my decision on his site with portable equipment (preamp, interface, computer). I use this console not only mix. I have not tested the preamps. My only experience was on an analog mixer Mackie Onyx. ATB wins hands down. Despite the characteristics measured slightly less good as the Mackie, ATB gives life to music and gives much more pleasure in the work of the mix. With these changes, the sound is much more accurate, especially in the bass, and background noise is reduced by about 8 to 10 dB. Note that I make these changes for the sake of tinkering. It is perfectly usable without it. During the implementation, we must be careful to "ground loops" (These precautions listed in the manual is not necessary for material well-designed, but 100 times more expensive ...). This means that the ground connections (braid audio cables, son yellow green food) must be implemented so that no disturbance current is flowing at 50 Hz in the mass of the console. To my knowledge, this console is the only one in its price range offers so many possibilities for routing, equals exceptional opportunity to easily tinker (double face cards with traditional media components) and musical color really nice. It is a success. We must now focus on the frequent criticisms of the breath of this console. Our ears are starting to get used to the quality of fully digital systems (computers with Pro Tools, Digital Performer and every imaginable plugins) in which the signal is analog at the level of speakers! The breath has disappeared from our world! In absolute terms, this is not evil, but the breath, in contrast to the distortion, does not mix unpleasant listening. Waves plugins some even offer a simulation of breath! This feature should therefore not be a hindrance especially for those who hesitate to buy this model. In summary, I would say that compared to mix everything in the box (even with good plugins simulation of analog devices), the mix on the ATB with little devices are less clean, less accurate but much more pleasant to listen. I found no other product as good in this price range. Since I sold the console to go on a TRIDENT 75. I stay on my mind. The Toft is a very good console for that price. She is beautiful, the finish is lovely. APRS qques hour test taken qques qques mix and this is indeed news. First to find any physical default. Qques knobs stuck a little, but by turning them several times the default disappears. Ditto for qques switches. The pots, switch and fader are trs good quality better than the Mackie, Soundcraft or B. ..
Pramps: trs trs clean and soft. By pushing a few (see many) found the same distortion as the MTA. It was for this that I rvais console. I use this saturation to drums and the large is heavy. C'qui is every need: Gain, 48v, phase, Mic / Line and I / P rev (flip). EQ: inspires 80b, the only diffrence is the components that are present. We are close to this trs mythical eq. The HI for trs (the 12k is perfect). The HI MID 1K 15k, 100k LO MID BASS 1.5 K and 120 or 60. While the + or - 15 db. The Q is not trs Troit, the English. Trs rendering both soft and powerful. ha I miss a 80Hz high pass. To: nothing spcial ... 5 to 6 which are prpost and 1 pre. Monitor: machine back with Pan, and Level-6 AUX5 to switch to Monitor, Monitor and Mute to Eq. It lacks a little solo monitor! And finally the slice, the Pan, Fader and routing. The quality of the fader is really cool. We have 8 buss, each with a return buss, which lets you toggle between dpart, and return machine. Each return of a buss possde Pan, and 2 to a Level. The also have a small solo t aprciable. There are 8 fx return directly affects the Stereo Master. Level + Pan. Ct's, we can boost each Fader (Track, Buss, Master) and thus obtain a grain really enjoyable. In short we just get something qque trs trs clean and deep, but if you boost the fader (and note the master) started purring heavily. This console characters. It has a wide dynamic trs. What I like most is that little work in the grain (saturation) without losing the bottom or rcuprer aggressive treble. This console can be trs clean working normal levels, colors and trs pushing gains and fader.